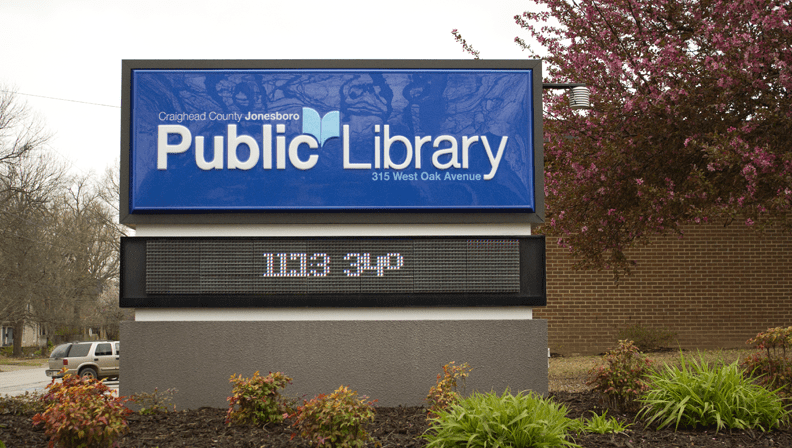 When I started working at the Craighead County Jonesboro Public Library (CCJPL), there was a preexisting visual identity associated with the brand that had gradually formed by a variety of designers and interns over the years. It was a look that needed work but already had a lot going for it. The most prominent visual feature of the brand was the logomark; a two-toned abstraction of an opening book. These optimistic, upward curves were especially appropriate for the CCJPL, where even the arches of the building seem to mimic the shape. ​With this successful logo mark and a strong local reputation, a complete rebrand wasn’t necessary nor cost efficient. However, in order to have a cohesive and effective visual identity a few key elements needed to change. The combination mark, which is both text and the logo. Note the changes to font and color, both of which are explored in detail, below. The brand’s color usage had the most potential for improvement. The two blues used in the old logo weren’t compatible. They were just different enough to clash, but similar enough to be unreadable when layered. The dark blue was a much more purple hue than the light blue. This caused major problems for the brand as the strongest, most noticeable colors were often confined to the logo. As a result, internal signage was often on plain white paper. Detail of the logo colors in the old and new logos. Note the decidedly purple hue in the old implementation of the logo. With a more harmonious palette, these colors were allowed to spill onto the rest of the space. Now there are strong, noticeable, consistent colors throughout the library’s marketing and signage that the public instinctively associates with their library. Century Gothic, a geometric sans serif, was heavily used in the old brand; Helvetica Neue, a neo-grotesque sans serif, is used in the logo. Similar to the original colors, these fonts clashed; they were different enough to be distinguishable but similar enough to serve the same purpose. By consistently using Helvetica Neue throughout the library’s visual assets, I was able to push a more unified, recognizable look. An overlay showing the visual differences between the fonts Century Gothic and Helvetica Neue. Use of both fonts in the overall brand identity led to font clashing. With these fundamental details addressed, the brand still needed to convey the scope of modern materials and services provided by the library. During promotional outreach events, I would often hear residents that were astounded to learn their library offered so much more than books. To help resolve this, I created a series of icons that relate to different aspects of the library. This created a visual reference to the variety of services we provide. They’re also used as background elements on promotional collateral given to new patrons. Above: A set of icons for use on the website and other material. Below: promotional collateral showing the logo and colors in use in print. 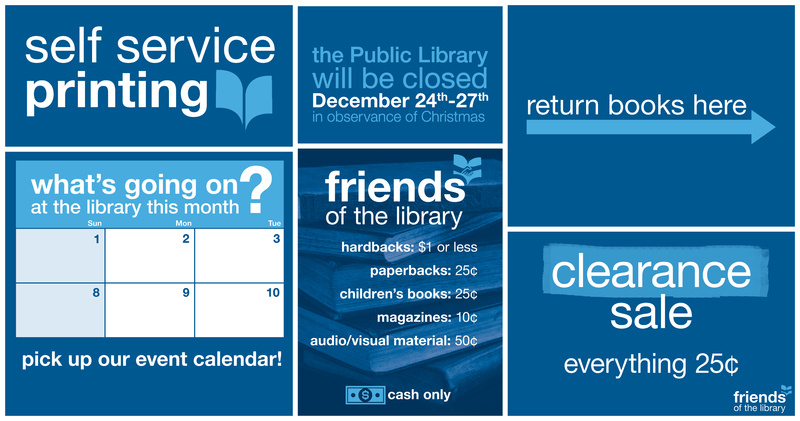 These revisions have given the library a cohesive, fun and efficient branding. The branding elements work beautifully together and are also strong enough to stand-alone. Now, even from a distance, all of our signage is unmistakably associated with the CCJPL. Check out this motion logo for CCJPL featuring the logo transitioning into some of the icons above.